The JanTech Model 105 offers the speed and efficiency of an electric motor driven marking machine at a price less than some hand operated devices. The widely used Model 105 is a longtime favorite for marking parts such as electronic or aerospace and defense components. With the versatile Model 105 system, you can imprint marks for identification, numbering and coding on parts with flat, curved or irregular surfaces. The Model 105 can accommodate a variety of print die systems: Rubber Stamp Printing Dies, Rubber Type, Photoengraved die plates, Metal Type, serial numbering heads and others. The Print Units are quickly changeable to convert to either direct or offset marking. Many types of marking inks are available for use with the Model 105. Your JanTech representative can make specific recommendations on inks as well as Print Units to suit your needs. The Model 105 comes "ready to use," needing only your Print Unit and ink to begin marking parts. Users need no special skill to take full advantage of the many features of the Model 105. Set up and running adjustments are easy to make. Using the Model 105, it is possible to mark up to 20 parts per minute by offset methods; up to 50 parts per minute by automated direct stamping. The Model 105 meets the demands of continuous industrial production line use. The low maintenance design incorporates ball bearings at all important wear points. The entire exterior of the machine is color anodized to provide an attractive, durable finish. The light weight Model 105 is a bench top unit that easily transports from job to job. "Direct" means the die applies the imprint by "direct" contact with the part being marked. With "Offset" marking, the print die applies a mirror image imprint to a soft rubber "offset pad." The imprint transfers to the part being marked when the part is pressed onto or rolled over the wet ink on the offset pad. The direct method is applicable to only flat or nearly flat surfaces on parts of uniform height. The offset method is universally applicable and the way to mark curved, irregular or parts that are otherwise not uniform. Both methods produce excellent results. Most any kind of printing die is applicable as a "Print Unit." Whether a rubber printing plate, changeable rubber type, metal engraving or metal type, each is useful for particular needs. Generally, rubber or other soft polymer dies are suitable for either direct or offset imprints. Metal or other hard dies are applicable for only offset marking or direct marking only on soft surfaces. In some cases, more than one die or kind of die can make up a Print Unit. Print Units install easily in the machine and change easily from job to job. The machines use paste or semi-paste inks that are chosen for suitability to the job. A very small amount of ink is sufficient to coat the ink roll and the rotating ink plate. Many, many parts may be marked before requiring more ink. Simple adjustments on the machine ensure that the ink roll barely touches the characters of the Print Unit and the Print Unit barely touches the item positioned on the work table. Momentary contact of the foot switch actuates the machine through one cycle. A cycle is complete when the printing arm of the machine with its inked printing die swings downward to its lowest point, touches the object being imprinted and returns to its starting point. The ink roll applies a thin coat of ink to the die as the print arm lowers and again as the print arm returns. A cycle takes less than three seconds with a "standard speed" machine; just over one second for a "double speed" machine. A positioning device for your part on your work table will be helpful for accurate repeatable placement of direct imprints. Creative use of guides or custom shaped offset pads will help accurately place offset marks. For precision placement of offset marks into really difficult spots, consider our Model 200 fixture. Please consider sending us samples of the parts you want to mark. Tell us what you want to do. We will mark your parts with a sample mark and return them with our recommendations. The JanTech Model 105 offers the speed and efficiency of a motor driven marking machine at a price less than some competitive hand-operated machines. With the versatile Model 105, you can mark on flat, curved or irregular surfaces. The Model 105 can accommodate a variety of Print Units: Rubber Printing Dies, Rubber Type, Photo-engravings, Metal Type and others. The Print Units are quickly changeable to convert to either direct or offset marking. Many types of inks are available for use with the Model 105. JanTech can make specific recommendations on inks as well as Print Units to suit your needs. The Model 105 comes "ready to use," needing only your Print Unit and ink to begin marking parts. Users need no special skill to take full advantage of the many features of the Model 105. Set-up and running adjustments are easy to make. Using the Model 105, it is possible to mark up to 20 parts per minute, semi-automatically; 50 parts/min. fully automatic. The Model 105 meets the demands of continuous production line use. The low maintenance design incorporates ball bearings at all important wear points. The entire exterior of the machine is color anodized to provide an attractive, durable finish. The lightweight Model 105 is a bench top unit that easily transports to the job. The Model 105EW, with Elevating Worktable enables direct printing onto taller parts. Same as model 105EW except with a Double Speed motor which operates at 50rpm rather than 25rpm, which gives it a faster stroke speed, 1.2 seconds per stroke rather than 2.4 seconds per stroke. The JanTech Model 200 fixture enables the user of Model 105 machines to place offset imprints onto parts with exacting, repeatable precision. It is particularly useful for very small imprints and for placing imprints into difficult locations. Imprints can be placed in depressed areas, on uneven surfaces, and close to obstructions. 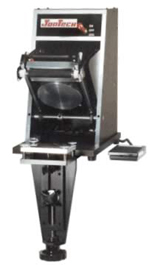 The Model 200 fixture is designed for an imprint area of up to about 1 1/2 X 2 1/2 inches (38mm X 63mm) and can accommodate parts up to 2 1/4 inches (57mm) tall. The Model 200 fixture quickly and easily mounts on a Model 105 machine in place of the standard worktable. The included clamping system enables X-Y adjustment of the fixture under the machine imprint area. 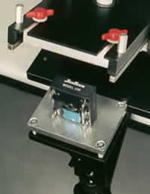 The four-post transfer table provides the Z and tilt adjustments for printing die contact to the offset pad. The part being marked is placed in a parts-holding device that is secured to the elevating worktable. The height of the elevating worktable is adjusted for contact of the transfer pad to the part. The worktable also provides for final small X-Y adjustments of the part under the transfer pad. The JanTech Power Stamper offers the speed and efficiency of a motor driven marking machine at a price less than competitive power operated machines. The versatile Power Stamper can accommodate many commercial self-inking stamps and pre-inked stamps for marking porous and non-porous substrates. The stamps are quickly changeable. Your JanTech representative can make specific recommendations on inks as well as stamp units to suit your needs. 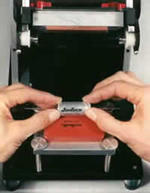 The electric motor operated Power Stamper comes "ready to use," needing only your stamp to begin marking. Users need no special skill to operate the Power Stamper. Set-up adjustments are easy to make. Operation is semi-automatic with a foot switch. Cycle time is just 1.2 seconds. The Power Stamper meets the demands of continuous production line use. The low maintenance design incorporates ball bearings at all important wear points. The entire exterior of the machine is color anodized to provide an attractive, durable finish. 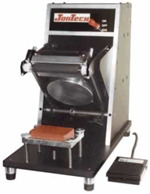 The lightweight Power Stamper is a bench top unit that easily transports to the job. The electric motor operated Power Stamper does not need compressed air for operation.